Retail Price $185 US dollars. Streamerica is a ground-breaking collection. Never before has Tiffany featured steel as a luxury material, but no other material could convey such a powerful message of contemporary sophistication and masculinity. 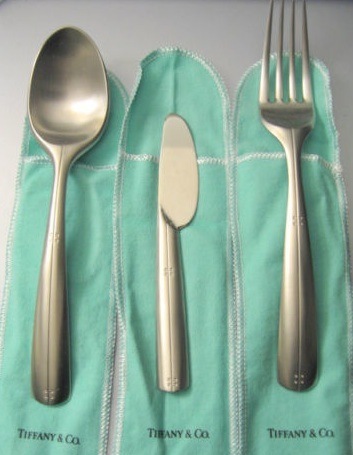 The Flatware line in stainless steel was one of the last additions to the streamerica line. Although they are really beautiful to look at and to use, I feel that their size was made a little too big and heavy. The small fork and spoon feel just about right, but the larger pieces are too bulky. I purchased two sets of these from the Tiffany store in Boca Raton, FL. Years later I found on ebay the serving pieces that composed of a larger spoon and fork, and a smaller knife (pictured below) to be used for cheese or maybe even butter. I have never seen these again on ebay. 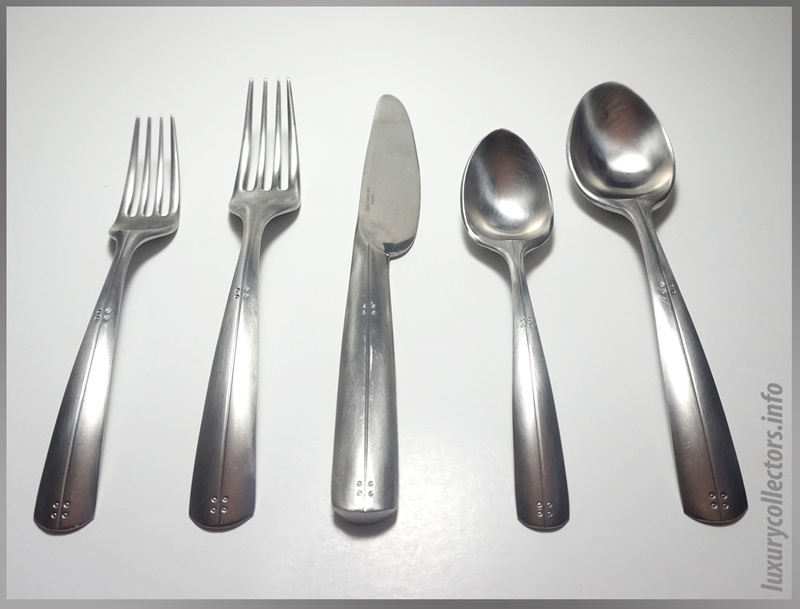 Detailed Photos of Streamerica Flatware set. 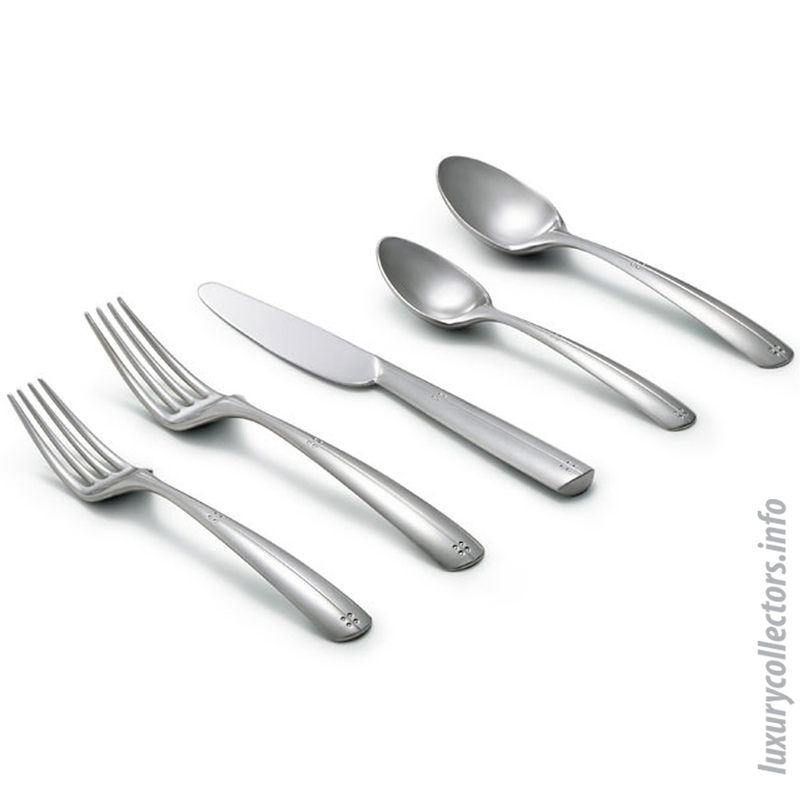 Tiffany Streamerica Flatware set of five pieces. 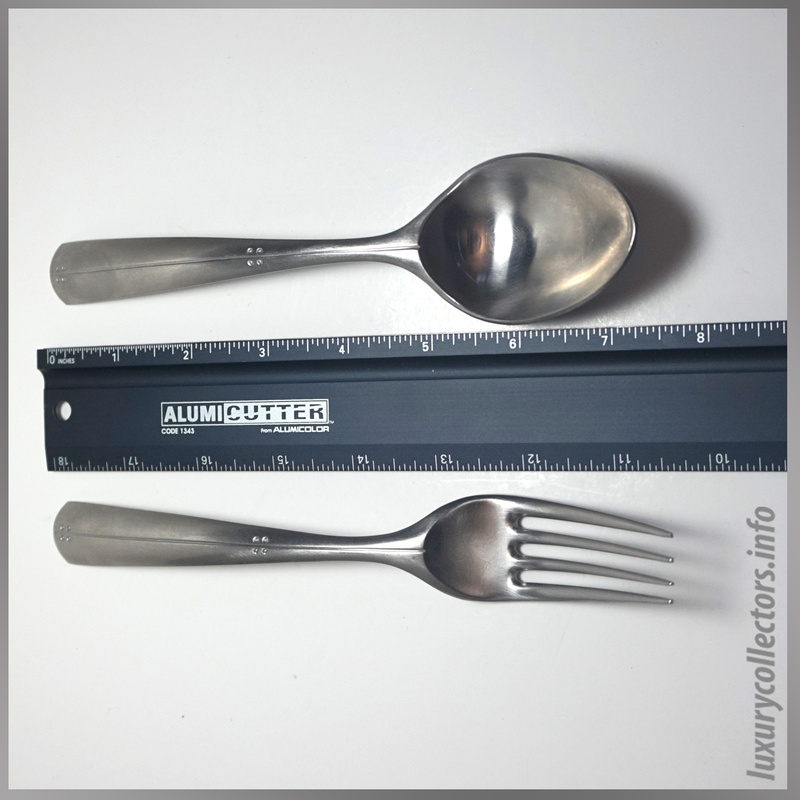 Measurements of one of the spoons and forks from this collection. Markings on the knife confirm that they were produced in 2000 and in France. Rare set of three serving pieces that includes a larger than normal Spoon and Fork, and a butter/cheese knife. I saw advertisements on a regular basis the season they released these, mainly in Vanity Fair magazine. I also found the same photo in one of Tiffany’s blue book catalogs from 2000-2001. 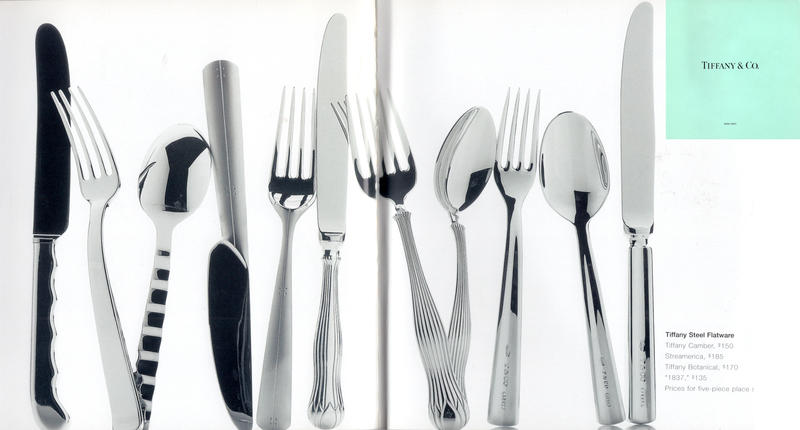 Advertisements of Streamerica Flatware set. A Clipping from Tiffany & Co. Blue Book Catalog 2000-2001. The five piece setting retailed for $185. 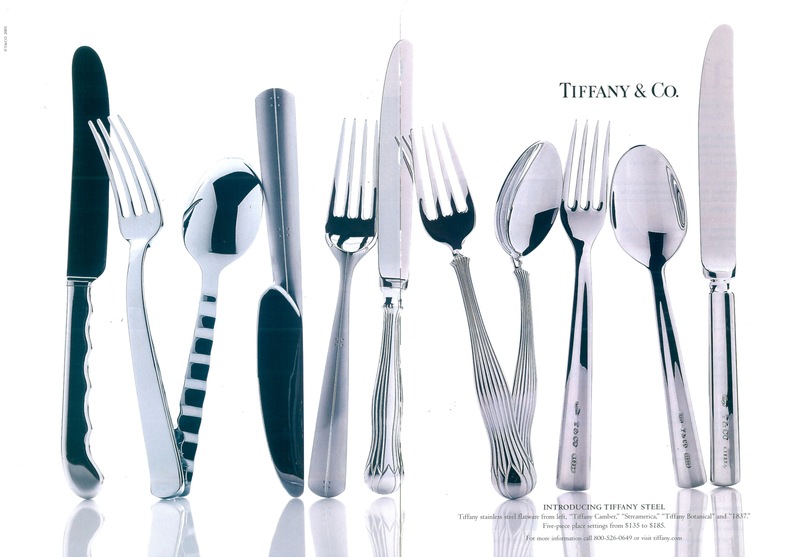 Magazine advertisement for Tiffany & Co. Steel Flatware from 2000, I think its from Vanity Fair.